No-Kill®.de - Blood Cancer Fight Fight with us against blood cancer and misery in this world! Bid with on one of our domains! Turn on a banner ad or link to your site! Donate and help children and needy people worldwide. For global Help, we need YOUR support. To get the latest news, simply register free of charge to the No-Kill® Forum. 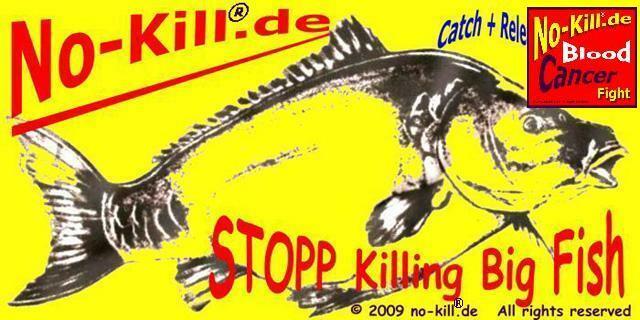 Dear visitor, welcome to No-Kill®.de Catch + Release Netzwerk - STOPP Killing BIG FISH. If this is your first visit here, please read the Help. It explains how this page works. You must be registered before you can use all the page's features. Please use the registration form, to register here or read more information about the registration process. If you are already registered, please login here.